Cleverly derived from the words, “Gaud;” meaning, brilliantly showy, and “Goddess;” A woman of extraordinary beauty and grace. 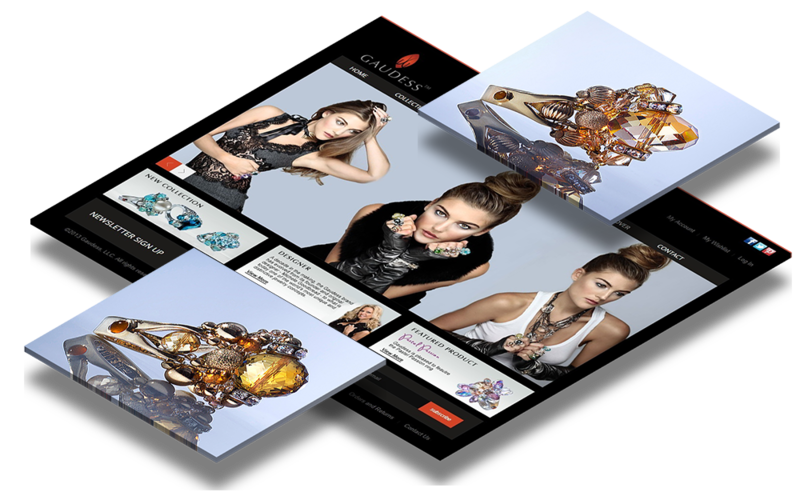 In every GAUDESS® piece there is an orange, semi-precious, carnelian gemstone incorporated into the design. The website for your company or your business should be on a totally different level than those of casual websites or those for your family, hobby or even your pets. Aside from having a no-nonsense layout that takes the visibility of all the important data and buttons into consideration, it should also be easy to navigate and project the feeling of authority, credibility and honesty. OrangeSpike builds websites that enhance functionality, improve user experience and capitalize on selling. We do this by creating easy-to-navigate, action-oriented designs. E-commerce websites must display a strong sense of integrity, credibility, and security to make the sale. By sharing your business goals, our team will optimize your site for conversions. Our web development experts will ensure that you’re appearing in more searches, which leads to more qualified visitors clicking on your site. You’ll also need seamless integration between all your systems to handle all those incoming orders! From your inventory management system to your shipping provider and invoicing software, we’re able to integrate your site with the tools you’ll need to keep your business moving forward. We also understand the need of reach mobile customers through responsive designs. Since over half of website traffic now comes from mobile devices, we know you’ll need an online presence that allows easy purchasing from a mobile device. Our website are guaranteed to look gorgeous on every kind of device. This means you can give your customers what they want: a beautiful (and simple) checkout experience – right at the tip of their fingers!